Arvor is a bright & airy ,modern ,two bedroomed ,non smoking ,well equipped,ground floor apartment close to Maenporth's sandy beach and less than a 10 minute drive to Falmouth.It has underfloor heating and a dedicated parking space for one car. There is a large open plan kitchen /dining/living space opening into a patio with garden table and chairs .The lounge has a wall mounted fire ,40 “ TV ,Blu Ray DVD player,free & unlimited wifi and iPod docking station . The kitchen is fully equipped including a dishwasher and fridge freezer and has a separate utility room with washer/dryer & sink. There are two bedrooms with non allergenic duvets & pillows - the master bedroom has a Kingsize bed and an ensuite shower room with large walk in shower.The second bedroom has twin beds. There is a separate family bathroom with bath and electric shower over the bath . It is a non smoking apartment and regretfully pets are not allowed to stay. lovely restaurant (The Cove ) which is very popular with locals and visitors . There are some beautiful coastal path and countryside walks right on the doorstep and the local village of Mawnan Smith has an Inn and a range of shops including a supermarket with post office ,cafe & restaurant. Falmouth is just a short 10 mins drive away with a wide range of shops,restaurants , beaches ,golf ,water sports swimming pool ,spas,cinema ,a castle .... and loads more ! 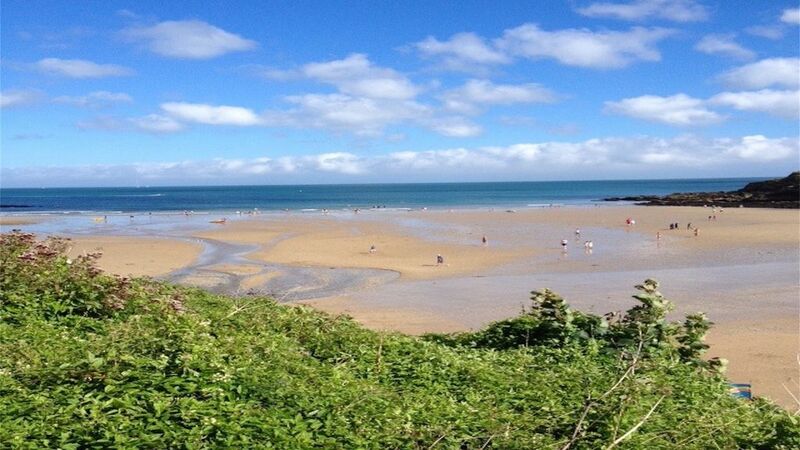 The apartment is an ideal base for walkers & families as the beach and coastal path are so close but in order to fully enjoy the surrounding area ,a car is needed. PLEASE NOTE Same day booking and arrival may be possible -so please contact me usine 'ask owner a question'. As you turn right to go down the hall you will find a the utility room ( with washer dryer ) and the family bathroom ( with bath and electric shower ) on your left . There is one shared ‘Mobilty ‘ space and two shared day visitor spaces that are available on a ‘first come ,first served basis ‘.The ‘Mobility ‘ space is situated at the top of the carpark and from there it is a level walk of about 25 metres to the front entrance . My family are Cornish and I moved to Cornwall 5 years ago .Its a fantastic place to live -beautiful scenery,great food and a lovely community . I spent many days at Maenporth as a child and love the coastal path walk from Falmouth to Maenporth . The walk is an easy coastal path with stunning scenery and The Cove Restaurant is one of my favourite outside eating places .Maenporth is a lovely sandy cove popular with families as it is ideal for sunbathing and rock pooling . The apartment is bright and airy but always feels cosy even on a winter's day due to the underfloor heating -even in the bathrooms ! I like the open plan living with its wooden floors and the modern kitchen with granite worktops . Most of all I enjoy the views of Falmouth Bay from the field just across the road and the superb coastal and rural paths right on the doorstep . Modern tiled bathrooms with underfloor heating ,both with mirrors and electric shaver points . There is a lift to access the other floors . Please do not allow children to use the lift unnacompanied or play in the foyer . Salt & Pepper grinders . A 'Welcome pack ' on arrival with tea ,coffee and some fresh milk in the fridge . 40 " Flat screen TV in lounge . The apartment is wheelchair accessible but there are no grab rails in the apartment . There is a step of approximateky 25 cms into the large shower cubicle in the ensuite . There are no grab rails but a portable shower stool is provided. There are several lovely coastal path walks just outside the apartment and a range of outdoor activities are available in the vicinity .These include Paddle Boarding ,Kayaking , Golf ,Crazy golf & Tennis . Falmouth is about a 10 minute drive away where you will find the historic Pendennis Castle ,the Maritime museum, two beaches ,a wide range of shops & restaurants , cinema ,several hotels offering spa treatments ,boat trips ...so its well worth a visit .There are also two beautiful gardens (Trebah, Gendurgan ) within a 10 minute drive away. We had a short break at Easter here with our two children aged 3 and 6, and the flat was ideal. Super clean and very well equipped - everything thought of which made holidaying with young children very easy! Things like buckets and spades, the utility room, a washer-dryer all so useful. And lovely touch to have tea and hot cross buns left. The beach at Maenporth is so easy to get to, and we really enjoyed the coastal walk to Swanpool - and the fab cafe with quirky ice creams and a bouncy castle! The leisure centre in falmouth provided entertainment on a very stormy day, and there was plenty left to explore. Beautiful Cornwall! Perfect weather for October. Fantastic gardens. Wonderful apartment and hostess. Stayed in a group of three adults. Plenty of space. Wonderfully equipped. Clean. well maintained. Steps to beach. Close to Falmouth amenities in a quiet private area. Wonderful apartment with everything we could want. Spacious, clean, comfortable, very well equipped ( including a laundry) and in a lovely quiet area near the beach. Beautiful ground floor apartment ! and Wi-Fi a big bonus to all! Lovely and quiet and a few minutes walk to Maenporth beach which was fab too! Will definitely want to return again. Thanks Gill! Thank you for the lovely feedback So glad you had such a great time . The apartment is situated two minutes walk from the coastal path ,leading to Maenporth's sandy cove with a restaurant and cafe .The beach is a short 5 min walk down hill across a field .The nearest village is Mawnan Smith which is about a 5 minute drive away and has a small selection of shops including a supermarket ,cafe and The Red Lion Inn . There are also two beautiful Gardens nearby -Glendurgan (National Trust) and Trebah . Trebah often hosts outdoor theatre /events during the Summer.